An extremely active stellar nursery glows in deep reddish tones in this Gemini view of NGC 2467 in the southern constellation of Puppis. The image displays a striking array of features that illustrate multiple phases of star birth. 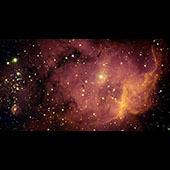 In the lower right, young stars are emitting hot radiation, exciting the nearby gas and causing it to glow and revealin denser gas and dust clouds. Dust lanes and dark globules mark sites of future star formation. A cluster of young stars dominates the left edge of the field of view. It is likely that several million years ago this region resembled the currently active star birth regions seen in the right half of the image. A wall of denser material dominates the right side of the image. Here ultraviolet radiation from nearby stars is removing material by a process called photo-evaporation and revealing underlying dense clouds that likely harbor forming stars. At bottom left a star can be seen exciting the cocoon of gas and dust from which it likely emerged. 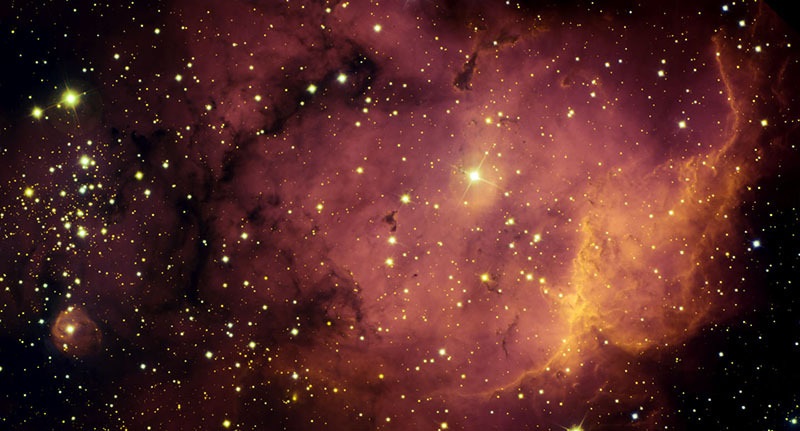 The NGC 2467 complex lies about 17,000 light-years away. Its distance has been calculated based upon a likely association with a nearby cluster (Haffner 19, not within image). The seeing in this image is about 0.50 arcseconds.